Oregon Days of Culture celebrates the role of the arts, humanities, and heritage in our everyday lives. Participate by attending any number of events around the state. 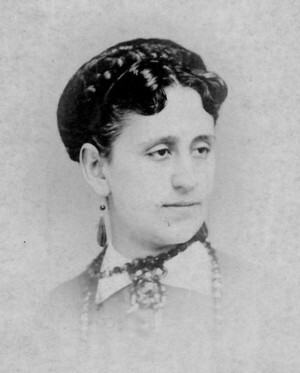 Esther Clayson Pohl Lovejoy, whose long life stretched from 1869 to 1967, challenged convention from the time she was a young girl. 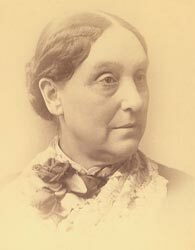 Her professional life began as one of Oregon’s earliest women physicians, and her commitment to public health and medical relief took her into the international arena, where she was chair of the American Women’s Hospitals after World War I and the first president of the Medical Women’s International Association. Most disease, suffering, and death, she believed, were the result of wars and social and economic inequities, and she was determined to combat those conditions through organized action. Kimberly Jensen, professor of history and gender studies at Western Oregon University tells the story of this important western woman, exploring her approach to politics, health, and society and her civic, economic, and medical activism. Dr. Jensen will offer brief remarks about the work of researching and writing the book and will be available to sign copies. Light refreshments will be served. Wear your sash proudly today! Click here to purchase a commemorative sash. Get the word out! Share this November 5 informational flyer (double-sided) in your community. Election Day - Remember to exercise your right to vote! An obscure grave in Portland’s Lone Fir Cemetery is the final resting place of a Black woman who helped change the world. 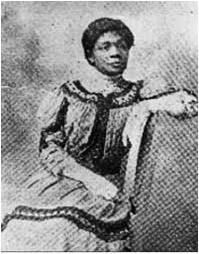 Her name was Hattie Redmond, and she was a leader in the 1912 campaign that won equal voting rights for Oregon women. Now, 100 years later, the Century of Action committee plans to give Redmond’s grave some long overdue respect. 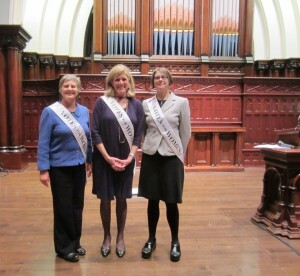 Century of Action is leading the centennial celebrations for the women’s voting rights victory. And they are looking for family, friends, or anyone with information about Hattie Redmond, to come forward and help design a headstone worthy of her achievements. To read the entire article go to “Century of Action Shines Light on Black Suffragist Hattie Redmond” or pick up a copy on your neighborhood newsstand. 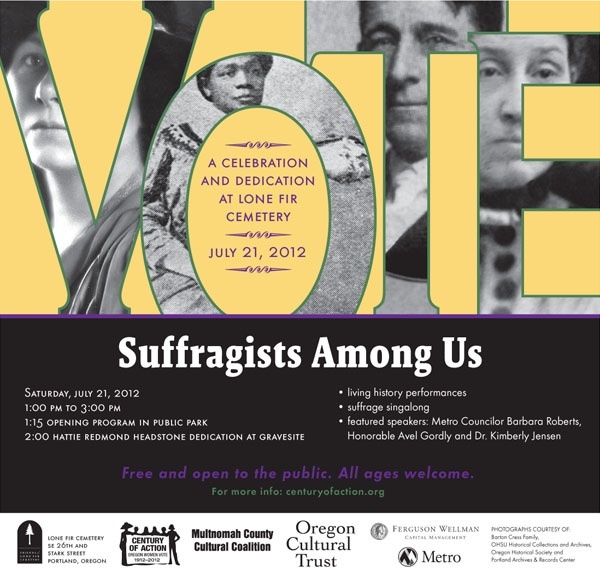 Join the Century of Action and the Friends of Lone Fir Cemetery July 21, 2012 from 1-3:00 p.m. at Lone Fir Cemetery for “Suffragists Among Us, a celebration & dedication at Lone Fir Cemetery.” The afternoon will honor the suffragists buried at Lone Fir Cemetery and will include a dedication of a headstone for Hattie Redmond. 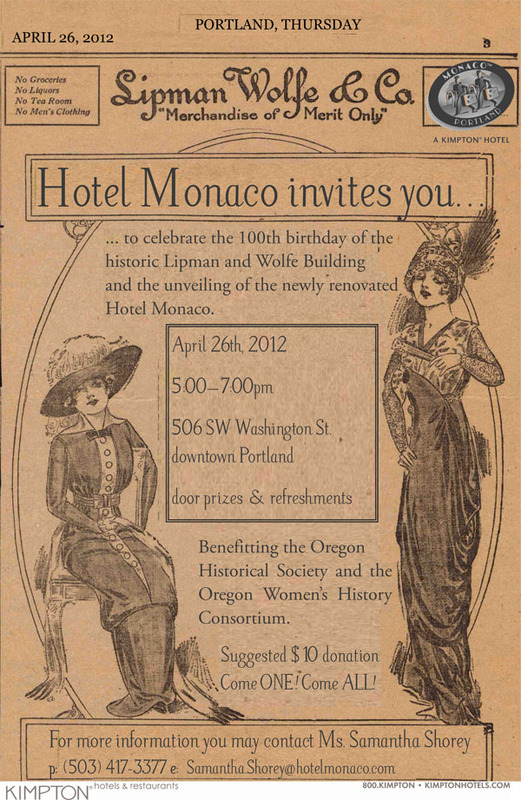 The Hotel Monaco is celebrating the 100th birthday of the historic Lipman, Wolfe & Co. building that houses it’s newly renovated hotel. Look for the bright lights, period cars, and suffragists protesting out front of the hotel. 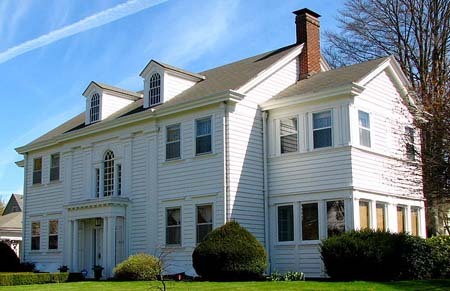 Inside you fill find historic photos of the Lipman Wolfe interior over the years, musical entertainment, raffles, refreshments and pro- and anti-suffragists trying to convince guests which way to vote on woman suffrage. 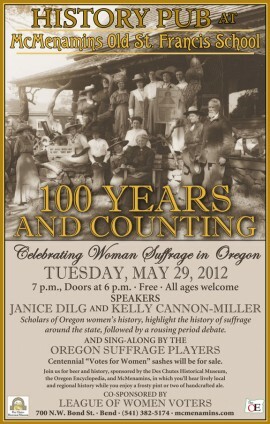 This event will benefit the Oregon Women’s History Consortium/Century of Action and the Oregon Historical Society. 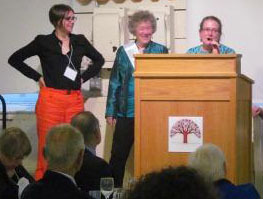 L-R: Janice Dilg, Century of Action, Eliza Canty-Jones, Oregon Women’s History Consortium, Senator Diane Rosenbaum (D-Portland) and Senator Ted Ferriolli (R-John Day). 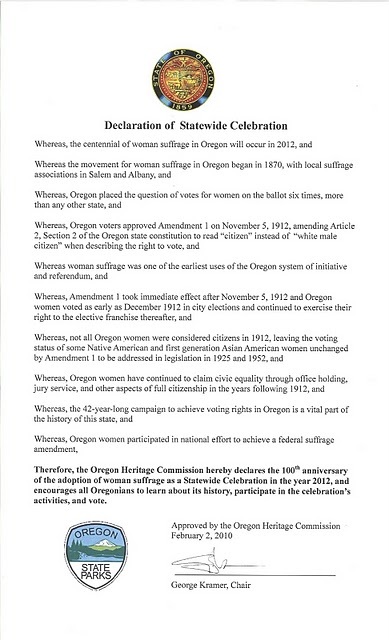 Yesterday the Oregon Senate unanimously passed Senate Concurrent Resolution 204 commemorating Oregon’s woman suffrage centennial. Senator Ted Ferriolli and Senator Diane Rosenbaum, co-chairs of the Senate Rules Committee, originated and guided the resolution to its successful conclusion. 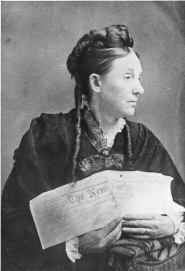 Senator Ferriolli’s comments in favor of the resolution noted the editorial rivalry between leading suffragist and editor of The New NorthwestAbigail Scott Duniway and her brother Harvey W. Scott, editor of the Oregonian newspaper. 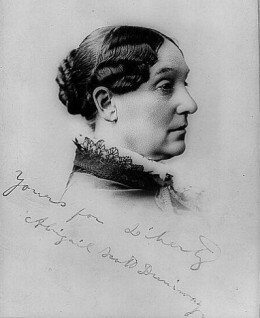 Duniway a strong advocate for women’s voting rights, and her brother’s equally ardent opposition to suffrage for women. Senator Rosenbaum noted the tenacity of Duniway and other suffragists in their 42 year struggle to gain the vote in Oregon. Despite being defeated at the polls five previous times, suffrage supporters rallied one more statewide campaign in 1912. With the majority of in favor of woman suffrage, the word “male” was removed from from the section in Oregon’s Constitution outlining the rules for voting privileges. “Mrs. 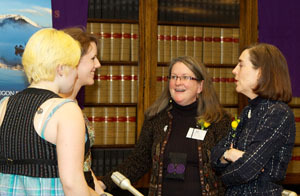 F.J. Bailey” (left) and “Sarah A. Evans” (right) debate the question of woman suffrage. 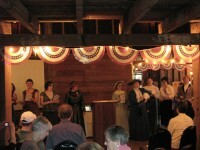 Prior to the vote by the full Senate, Eliza Canty-Jones and Janice Dilg (seen above) presented an excerpt from the Century of Action’s acclaimed mock town hall debate on the question of woman suffrage. “What’s Suffrage Got To Do With It” uses arguments found in news articles, speeches, and editorials the 1912 campaign that express the pros and cons of extending voting rights to the women of the state. 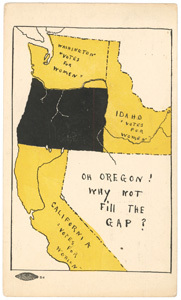 Jones portrays anti-suffrage sentiments in the role of Mrs. F.J. Bailey President of the Oregon Association Opposed to the Extension of Suffrage to Women. 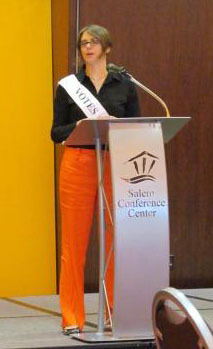 Dilg expresses pro suffrage arguments as activist and Portland Woman’s Club President Sarah. A. Evans. Two former Secretaries of State, Gov. Barbara Roberts and Hon. 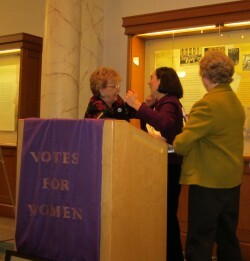 Norma Paulus sashed current Secretary of State Kate Brown. The Hon. Avel Gordly expressed her appreciation for all the women who paved the way for her generation of activists and elected officials. Suffragists surround Secretary of State Kate Brown to hear her story of Charlie Parkhurst the first woman to vote in Oregon. KGW’s Joe Smith highlighted the Votes for Women! 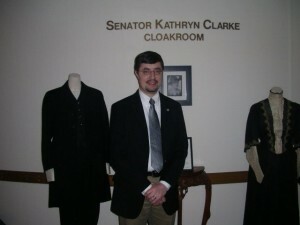 exhibit opening and Secretary of State Kate Brown’s story of Charlie Parkhurst, the first woman to vote in Oregon. 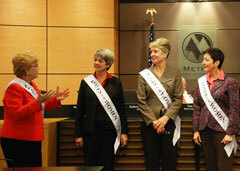 Would you like a Votes for Women sash? 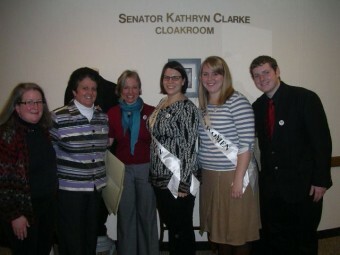 Learn more about the Century of Action’s Sash Project and how to purchase one here. Women in Oregon won the right to vote in 1912, nearly a decade before most women of the United States achieved suffrage in 1920. Votes for Women! The Oregon Story explores the campaign undertaken by courageous women (and men) who were determined to give Oregon women equal access to the voting booth. The success of the woman suffrage movement propelled women into civic and political roles that may seem ordinary to us one hundred years later. More than four decades of struggle before 1912 and a century of action after it place women at the center of political and civic life in our state. 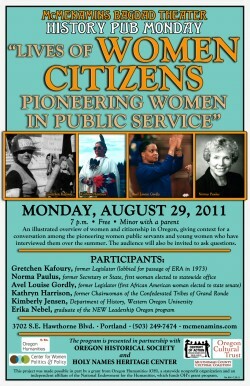 Come learn about this vital chapter in Oregon’s history. Wednesday, February 1 • 6–7:30 p.m.
Join us for refreshments and remarks from Secretary of State Kate Brown, the Honorable Avel Gordly, Professor Kimberly Jensen, and special guests. Margie Boule will provide the singing! Sunday, February 26, 2–3:30 p.m. Author Ruth Tenzer Feldman will read from and sign her young adult historical novel, Blue Thread (available for sale). 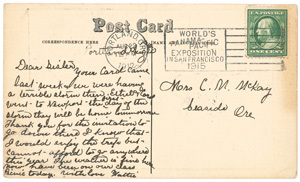 The book features a scandalous 1906 “petticoat card,” and the author will help voters-to-be design postcards to send to government leaders. Presented in conjunction with the Votes for Women! The Oregon Story exhibition. Family Friendly. 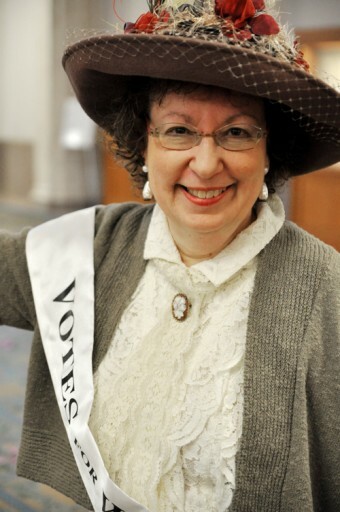 Jean Ward and Elaine Maveety, co-authors of Yours for Liberty: Selections from Abigail Scott Duniway’s Suffrage Newspaper, will introduce Duniway through a visual presentation followed by a lively exchange of her women’s rights and woman suffrage writings. 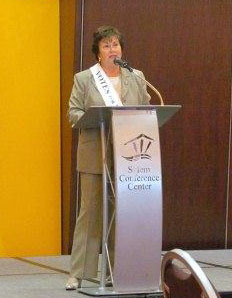 Presented in conjunction with the Votes for Women! The Oregon Story exhibition. Presented by Century of Action, celebrating 100 years of Oregon women’s right to vote and advancing the understanding of women’s citizenship in Oregon’s history. Visit www.centuryofaction.org for related programs and more information. 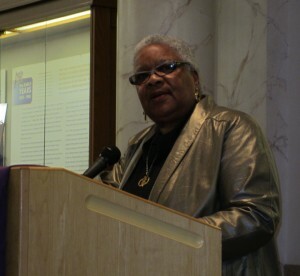 It is with great sadness that we learned that the Honorable Betty Roberts died Saturday, June 25, 2011. Her personal and professional accomplishments were many, but she never rested on her laurels. Roberts was equally effective in mentoring others and cultivating the next generation of women leaders. 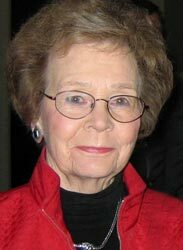 When the founding members for the centennial celebration of Oregon women gaining the vote were brainstorming ideas, Betty Roberts was the first person we called for advice. Roberts immediately offered to meet, and quickly became an enthusiastic advisor and supporter. Betty Roberts’s life and work epitomized the century of action that Oregon women have engaged in since winning the right to vote. She will be sorely missed, but her legacy will endure. Jefferson Exchange host Geoffrey Riley will interview Century of Action project director, Janice Dilg from 8:30-9:00 a.m. tomorrow morning, April 14th. Century of Action is a project of the Oregon Women’s History Consortium and is collaborating with organizations around the state to plan events and programs to celebrate the centennial of women getting the vote in 2012, and exploring the significant ways women have helped shape the State of Oregon through civic engagement over the past century. Jefferson Exchange is JPR’s lively interactive program dedicated to stimulating constructive civic dialogue about regional issues, and providing a place to meet the interesting people and community leaders of Southern Oregon and Northern California. 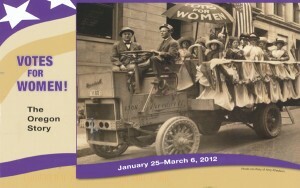 I am so excited to be here to share an historical journey with you that will take us to November 5, 2012, the 100th anniversary of Oregon women’s right to vote. 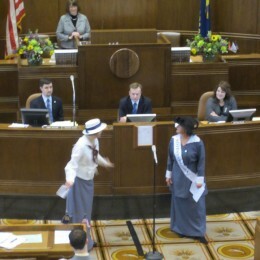 And from that historical date in 1912 until today, the women of Oregon have indeed experienced a “Century of Action”. Now, as women in Oregon continue to make history, it becomes more and more crucial that we understand and appreciate our history and that we make certain it is passed on to new generations of young women and girls. An important element of the historical work we will be doing over the next months is what I call “carrying the water” for generations of women who will follow us. For the truth is, for most women in this country, someone else carried our water . . . and we can’t afford to return an empty bucket. Women marched and were jailed, spat-on and even force fed so women could vote. Someone was the first woman in law school, the first woman police officer, military officer, physician, engineer, labor leader. Someone in this country was the first and only woman Mayor, the first woman on a corporate board, to serve on a city council, to be a college president, astronaut, Olympic champion, legislator, judge – the list goes on. Across this country, they carried our water. And while history may not always measure these women fairly in terms of their accomplishments and leadership, they broke the molds and made it easier for the women who followed, women like me. They carried our water. They blazed the trails. And now, we must lay the concrete for the women and girls who will follow. Looking back in Oregon history, long before we had first secured the right to vote; there was an long and amazing history of Oregon’s tribal women. Most often, these women were the storytellers who passed on centuries-old tales – tales of their people and their lands. In more modern times, tribal women have often been the only remaining speakers of their tribes’ native tongues. These elders have taught young tribal members those languages to make certain they were not lost forever. Today, we are seeing more Oregon tribal women rising to leadership as tribal chiefs. Those of us who grew up in Oregon know the stories and legends of Sacajawea who acted as a guide to Lewis and Clark as they explored the great Northwest. Without her knowledge of the land, the pathways, and the tribes, the Lewis and Clark exploration might be barely a footnote in history. The next wave of women into the west transformed this region in ways that still impact us today - - - the women of the Oregon Trail. The diaries of those difficult treks across the continent were almost entirely written by the women and teenage girls on those wagon trains. They recorded the challenges, the births, the deaths, the changing scenery, the hardships, and the hopes. They preserved that history for all future generations. And these same women of the trail helped start the schools, the libraries, the orphanages, the small businesses of pre-statehood times in Oregon. And they worked side-by-side with their men to establish farms out of the wilderness. Perhaps it was those Western “partnerships” that encouraged Oregon’s male voters to extend voting rights to the women of Oregon – eight years before the Federal suffrage passed in 1920. And now, today, every place you look in our State, Oregon women are making history and changing history. For example, women are in decision-making roles at every level of government - - - school boards, local governments, the State Legislature, Congress, and judicial benches. We have witnessed a political revolution. We are at the table and we are changing the menu. But we should not celebrate these gains without acknowledging the sacrifices earlier women made – the cost of women’s political victories. In Oregon, two viable, experienced, capable women, Betty Roberts and Norma Paulus, ran for Governor ~ and lost. Two women ran for the U.S. Senate ~ and lost. A 100% qualified woman ran for State Treasurer ~ and lost. Women ran for Congress in Oregon ~ and lost. But one painful brick after another, they laid the path that helped me and other women win. In Oregon, we’ve now had a female U.S. Senator, three women in Congress, a woman as State Labor Commissioner, two women State Superintendents of Public Instruction, three female Secretaries of State, four women on our State Supreme Court bench, three women Mayors of Portland, four women Speakers of the House, a woman Mayor of every one of Oregon’s ten largest cities, three women on Oregon’s Federal bench, and I’ve had the honor to serve as our State’s Governor. More and more bricks; a longer and longer path for women to follow. And, before you know it, it is no longer simply a path. It is a solid foundation on which new women leaders may stand tall. 1. 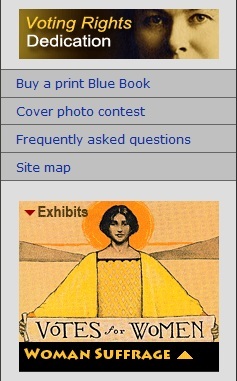 Learn about women’s history. 2. Share your expanded knowledge, especially with girls and young women. 3. Remember to acknowledge those who “carried our water”. 4. Encourage women to step forward and lead! 5. Take extra pride whenever you quote Oregon’s official state motto: “She flies with her own wings”. Before November 5, 1912 Oregon women could not fully vote for who represented them at the state, county, or federal level, or have a say in legislation, let alone hold elective office. That day changed everything after a majority of the men of Oregon extended the basic right of citizenship—the right to vote—to the women of the state. With the vote, the women of Oregon have engaged in a century of action. 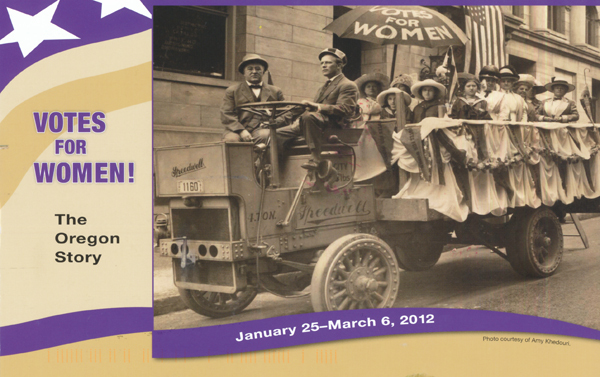 Join Oregon Secretary of State Kate Brown and Century of Action as we begin the countdown to 2012 and the centennial celebration of Oregon woman suffrage and beyond. The evening’s featured speakers, the Honorable Barbara Roberts and the Honorable Norma Paulus, helped shape today’s Oregon with their votes and their actions. 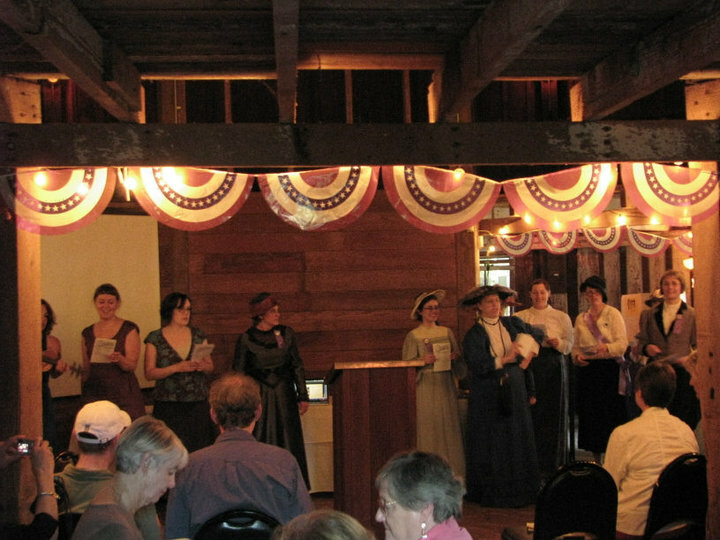 The event will highlight the launch of the Century of Action website, the Oregon Blue Book online woman suffrage exhibit, and the and the official reading of the Statewide Heritage Proclamation for the Oregon Woman Suffrage Centennial. Century of Action is organizing the celebration of 100 years of Oregon women’s right to vote and advances the understanding of women’s citizenship in Oregon’s history. 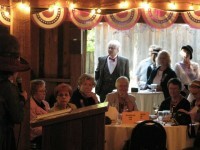 Take 1 octagonal barn, 1 suffrage lecturer, 2 pioneer women political figures, 15 Suffrage Players, and 161 history enthusiasts and you get one packed, fun, sing-along educational evening at the Century of Action-Oregon Encyclopedia History night at McMenamins Cornelius Pass Roadhouse last Tuesday. 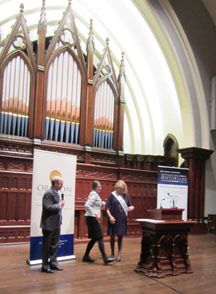 In addition to learning about how Oregon women got the right to vote in Oregon in 1912, and the important contributions women have made to the state in the century since then, attendees donated over $2500 dollars to the Century of Action centennial project. Thank you all for making this a great event! 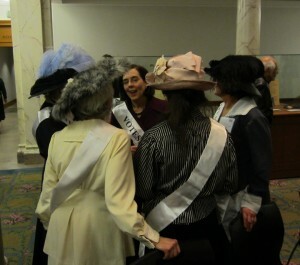 For a glimpse at some of the festivities see below or go to our Century-of-Action-Oregon-Women-Vote Facebook Page.